What and who defines what a hero is? My answer would be that a hero is someone who commits a courageous action without considering the consequences, or extra ordinary individuals who find the strength to persevere and endure inspite of overwhelming obstacles. At the end of January in 1996 on the islet of Imia (Ίμια), which is a set of two small uninhabited islets in the AEGEAN SEA, at the GREEK ISLAND CHAIN OF DODECANESE, a war almost broke out between Greece and Turkey. That night, Greek special forces landed on the east islet without being spotted by the nearby Turkish ships. On 31 of January, at 01:40 Turkish special forces landed on the west islet escalating the tensions, and a Greek helicopter took off at 05:30 from the Greek frigate “Navarino” for reconnaissance. 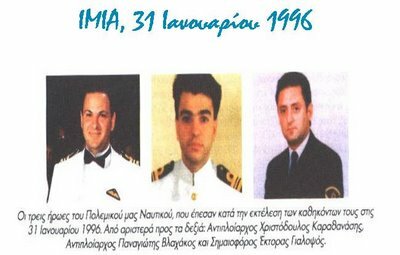 During the mission the helicopter crashed over the islets (some speculating due to Turkish fire) and three Greek officers died. These heroes died in respect of the Greek flag because they, as most Greeks around the world do, regard the Greek flag as our country’s highest and most recognizable symbol. When I see anarchists burning their country’s flags I can only feel anger. They have no respect for Greece, its traditions, culture and history and that is why they never show any respect to the flag. It is insane… have they ever considered that to even have such a choice, and to live by choice, is a result of many battles for democracy that were fought for for that flag? The soldiers who died on Imia that night didn’t. They did not think of their well being… but jumped right into the fire in respect to the Greek flag. Their sacrifice is not only remembered by their families… for we will never forget their courage. And although we can never repay that kind of dedication and selflessness, we can – and we MUST – honor and remember it always! ← How and why have illegal migrants occupied our university buildings? With what right? I always respect and admire these types of people. They are courageous, selfless and noble. And an asset to their countries. It’s a shame when the world loses souls like these.